Welcome! 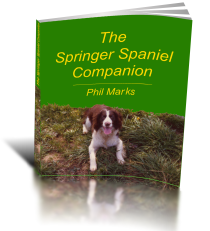 If you are interested in Springer Spaniels – finding, owning, training, nurturing – in fact, sharing your life with one (or more! ), then you have come to the right site. I’ve just added a News section – stories about these remarkable dogs. See the left hand side of your screen for more details of both the mini-course and the book (or click the menu if you’re on a mobile). 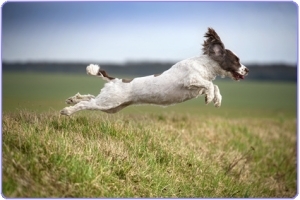 Please browse the links and articles and learn a whole lot more about these great dogs! 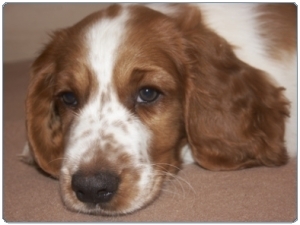 A Welsh springer spaniel puppy wondering what it’s all about. His eye color will solidify to hazel as he matures. My book is packed solid with advice and information! Besides making the best family pets, they are also a hard-working breed, used in a wide variety of roles from public protection, drug searching and front line explosives sniffing, to protecting ancient monuments from termites. Fantastic! Thank you for visiting, but before you go, have a ‘sniff’ round on the site yourself – there’s a load of information here.